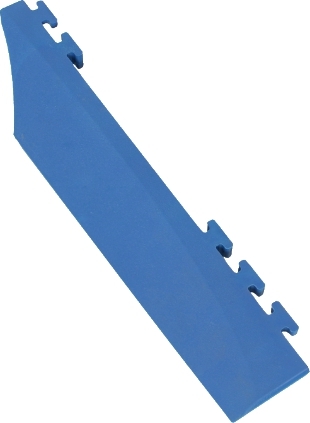 Enlarge Enlarge Defender pre-drilled Midi cable crossover for Wheelchair ramp, blue. 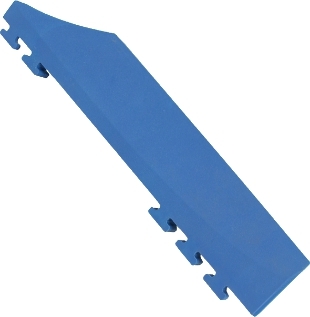 Enlarge Enlarge Enlarge Enlarge Enlarge Defender Wheelchair Ramp with 3 Lines (6 ramp pieces), matching extremity pieces and the blue pre-drilled Defender Midi cable crossover. Professional cable protection combined with a practical solution to make the Defender MIDI cable crossovers suitable for wheelchairs, walking frames and trolleys. Light, professional and above all, very flexible in terms of extendibility. 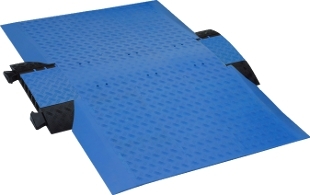 The main elements of the ramp (25cm) and the side elements (9cm) make a variable crossover width (minimum 80cm) possible. The components can simply be interconnected and then laid over the crossover. As it is the case with all crossovers of the DEFENDER series, the Defender Wheelchair ramp is oil, acid, and petrol resistant. 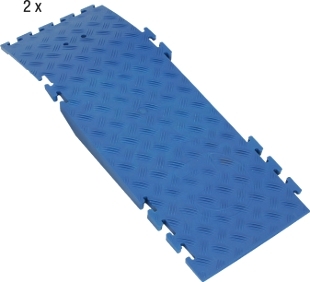 We recommend the use of our wheelchair ramp set including 3 Lines (6 ramp pieces) with the matching extremity pieces. These pieces must be used together with the blue pre-drilled Defender Midi cable crossover. The drilling ensures that the ramp doesn t slide from the cable crossover. With this configuration the drive across zone is 80 cm wide. It is of course possible to extend the ramp s width by using more lines.